Inspired by the growing body of literature linking natural resource scarcity to conflict, dating back at least to the 1960s but gaining momentum in recent years, Norwegian Ole Magnus Theisen published a review of the statistical literature on this link in 2008. In short, his conclusion was that large scale violence was generally not linked to scarcity of natural resources; but in stead to poverty and poor governance. The literature reviewed have argued resource scarcity was the main cause of the Rwandan genocide, violent local clashes in Kenya, South Africa, Assam, Chiapas, Sudan and elsewhere. With varying significance land degradation, freshwater scarcity, population density (growth), deforestation, youth bulges, deviations in precipitation and similar factors have been shown to increase the risk of violent civil conflict. The problem is: when updating and expanding the datasets of two of the previous studies, Theisen was unable to replicate the statistical results. Theisen points out some of the problems with the studies he revisit (and with his own): Statistics have problems with investigating complex interactions such as those from natural resource scarcity to conflict, ecological fallacies are easily committed when calculating on national averages, which area is degraded and which is a rich land is sometimes determined by the eye of the beholder. Much has happened and much has been written in the three years since Theisen published in Journal of Peace Research. 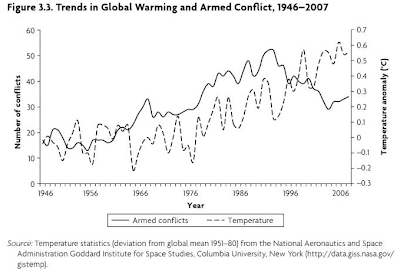 He himself have co-authored a chapter, Implications of climate change for armed conflict, in the book Social dimensions of climate change: equity and vulnerability in a warming world, in which he calls the warnings of climate change possibly leading to more conflict "alarmist" (as "exaggerated"). The point is, climate change and/or resource scarcity caused by climate change or other factors are never the primary cause of conflict. But it may add yet another unbearable burden to already struggling societies and through complex social and political pathways it can contribute to conflict risk. 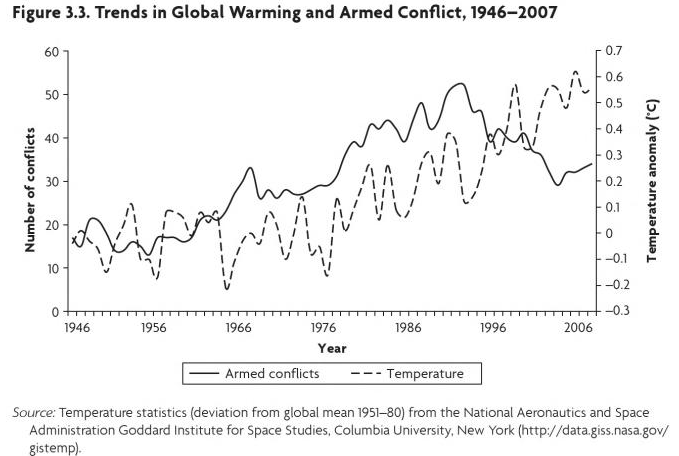 Global warming linked to conflict - not really. Post Cold War dynamics are clearly different. Social dimensions of climate change, page 80. In climate change related political news (not academic research) the CIA has established a climate change office from which all research is top secret, Russia is expanding with two Arctic brigades of marine infantry and the notion of climate change already causing conflict is spreading. And that's just some recent reports, much more is to be found here at Ecowar. Early 2011 the risk of riots was statistically linked to food prices. A food price spike in 2008 led to many food riots which in turn inspired increased "land grabs" - multinational corporations or corporations from non-poor countries buying up land in poor countries with the intention of growing food products (and biofuel) for the world market. In fact, since 2008 areas about seven times the size of Germany have been scooped up. In Guatemala hundreds of indigenous villagers have been chased from their rural homes, their huts burned as the military clear the area for richer farmers or agricultural businesses. In Nigeria, some villages have just clashed over disputed lands. Again, just some recent news. I suspect Theisen's 2008 study would come out a bit different if done today just three years later?